Like many fans of post World War II men’s pulp adventure magazines, I was originally attracted to them by their cool painted covers and interior illustrations. After I began collecting and reading the magazines about five years ago, I found that many of the stories in them are equally cool. Some are amazingly good, gritty pulp fiction yarns written by talented writers. Others are good in different ways. Some are like old Grade-B movies that are so bad — or so wild and crazy — that they’re good. Some provide fascinating glimpses of mid-Twentieth Century American culture that you won’t get from reading mainstream history books. 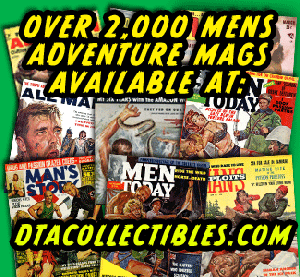 I discovered that there are a couple of excellent books about the men’s adventure magazine genre: IT’S A MAN’S WORLD and MEN’S ADVENTURE MAGAZINES. However, they both focused on the magazines’ history and artwork. 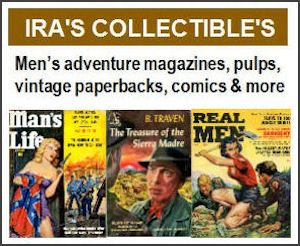 There were no modern book anthologies that reprinted stories from the post-WWII men’s adventure magazines, like there are for the pre-WWII pulp fiction magazines. The first was WEASELS RIPPED MY FLESH!, published last December by New Texture Books. I co-edited that collection with the head honcho at New Texture, Wyatt Doyle, and author/journalist/musician Josh Alan Friedman. A few days ago, New Texture officially released our second collection of classic men’s adventure stories: HE-MEN, BAG MEN & NYMPHOS. It’s now available on Amazon. The WEASELS anthology includes stories by twenty different writers. This new one is an authorized anthology of stories by a single writer: Walter Kaylin, the guy that other, better-known writers who once worked for men’s adventure magazines in the 1950s, 1960s and 1970s considered to be one of the best men’s adventure writers of them all. In 1984, Josh Alan Friedman did an interview with Mario Puzo, author of THE GODFATHER, about the days when he and Walter were both staff writers for Magazine Management, cranking out stories for MALE, MEN, FOR MEN ONLY and STAG and other top men’s adventure magazines published by the company. It’s an honor and a pleasure to make Puzo’s wish come true by reprinting fifteen classic Walter Kaylin stories in our new anthology. 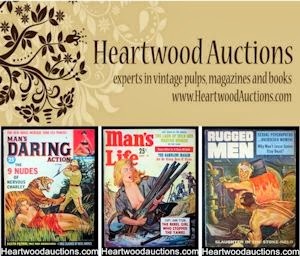 Back in the day, Walter wrote almost every type of story that was featured in men’s adventure magazines, from Westerns, war stories and exotic adventure yarns to spy stories, noir crime thrillers and exposés. Classic examples of all of those are included in HE-MEN, BAG MEN & NYMPHOS. Most of the stories were originally published under Walter’s own name. Some were originally credited to his favorite pseudonyms, Roland Empey and David Mars. Like the WEASELS anthology, each story is accompanied by scans of the cover of the magazine it was in and the artwork or photos that appeared with it. In the Kaylin anthology, we also added attention-grabbing pullout quotes from the stories as graphic elements. The images below show how those elements look for our reprint of Walter’s exotic adventure yarn “The Helicopter Hero and the 100 Ladies of ‘Undress’ Atoll,” originally published in the September 1959 issue of MEN. The illustrations in the print version of the book are in black-and-white. We’re planning to use full color in the ebook version, which should be available early next year. You can see how the print version looks and read excerpts from the stories by using the “Look Inside” feature in the book’s Amazon page. In addition to Walter’s stories, the book includes reminiscences by Walter about his writing career, drawn from phone calls I’ve had with him. There’s also a moving and insightful preface by his daughters Jennifer Kaylin and Lucy Kaylin, who became successful writers and editors in their own right. And, there’s a fascinating interview with writer Bruce Jay Friedman. In the late ‘50s and early ‘60s, before he became an acclaimed novelist and playwright, Bruce was the editor of several of the men’s adventure magazines Walter and Mario Puzo wrote stories for. I am very grateful to Walter, Jennifer, Lucy and Bruce for their support and participation in this book project, and to Josh Alan Friedman for putting me in touch with Walter several years ago. 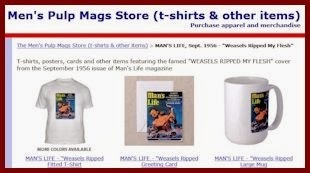 If you’re a fan of the MensPulpMags.com blog or the WEASELS RIPPED MY FLESH! anthology, I'm pretty sure you’ll like HE-MEN, BAG MEN & NYMPHOS. If you order a copy and enjoy it, I hope you’ll spread the word about it online by posting a review on Amazon or GoodReads.com or by mentioning it on your Facebook page, blog or website. 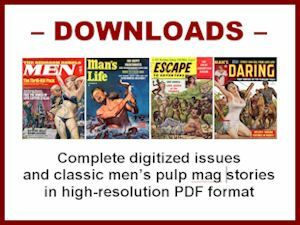 Those reviews are like gold for niche indie publications like ours and will help make it possible for us to publish more men’s adventure magazine anthologies in the future. I already have several more in mind.